One common misconception about identity verification is that only retailers need it. I guess this misconception comes from people mostly associating fraud with stolen credit cards and stolen goods. 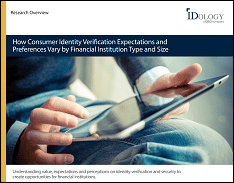 Yes, online commerce does have a need for identity verification related to high end purchases. But there are many other use cases and industries that need it. Just today we announced a use case that is really unique. Redfin, the first online brokerage, is using identity verification to improve the process of buying and selling a home. This is a great example of an industry traditionally tied to the bricks and mortar identity verification process evolving to a virtual world. Redfin is the only major search site to feature listings direct from broker databases as well as for-sale-by-owner and foreclosure properties from across the Internet. Before using IDology, Redfin’s process of verifying the identity of potential customers was cumbersome both for clients and agents. Because Redfin agents handle every facet of a transaction, including tours, pricing analyses, negotiations, inspections and closings, the company wanted to find an easy way for customers to validate who they said they were that would help streamline the process for their agents while also eliminating fraud. “Our previous identity verification method required customers to upload, email or fax their driver’s license, passport, or military ID. This caused many people to bail out and not go through the next step of meeting with an agent. We were looking for a more efficient and less time-consuming way for our customers to verify their identity,” said Bryan Selner, Vice President of Products at Redfin. Now, instead of submitting proof of identity via email or fax when scheduling a home tour, clients are presented with a brief multiple-choice quiz that is dynamically generated in real-time by IDology’s ExpectID IQ product. IDology’s ExpectID IQ solution delivers out-of-wallet questions based on a person’s history which are designed so that only the actual person of the claimed identity will know the answer. This new process protects Redfin agents and ensures home tours are being scheduled with real, legitimate people. Pretty cool out-of-the-box thinking. What about your business? How does it need to evolve?